As in years past, I want to preface my list by noting it’s not really a “best of” list; instead, it’s a list of my favorites from 2014. Some are mainstream, some are not. This year I’d say the big emphasis was on creativity, whether it’s the subject matter, the presentation or other behind the scenes work. Sometimes it’s a mix of all those things. Unbroken - Angelina Jolie follows up the overlooked and underappreciated In the Land of Blood and Honey with further proof she is a creative force to be reckoned with behind the camera. 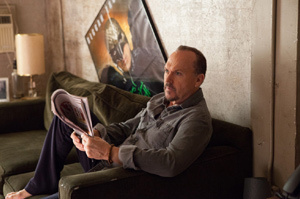 Birdman - a tribute to and an exorcism of the creative spirit told with fantastic style. The Man Who Saved the World - a docudrama about nuclear war averted; several years in the making and the payoff is terrific. Interstellar - Christopher Nolan crafted a complex space adventure that rewards repeat viewings. Mr. Kaplan - Uruguay’s 2015 Oscar contender is a shining example of the power of film, universal themes and how much alike we all really are when the lights go down and the movies start. 20,000 Days on Earth - a nifty documentary about musician Nick Cave and his creative process. Under the Skin - Scarlett Johansson takes some major risks in this art house sci-fi flick. The Expendables 3 - it’s a series that gets better with each installment and I consider this to be the year’s most entertaining movie. I strongly disagree with all the haters out there. Big Eyes - Tim Burton is in fine form with this true-life tale about a quirky painter. John Wick - Keanu Reeves stars in this movie that does so well what it sets out to do: tell a tale of revenge in a slick New York City underworld.